Senior BEVERLY WHELAN (777) finished ninth in Friday’s New England Cross Country Championships and will join captain MAIREAD O’CALLAGHAN (769) in the NCAA Regionals on Nov. 15. Despite resting a number of their top runners, the Harvard men’s and women’s cross country teams still impressed amidst the large field of competitors at the New England Cross Country Championship at Franklin Park. The Crimson hopes to prove that its runners are underestimated in the eyes of Heptagonal competition, looking to play the role of underdog in two weeks time. 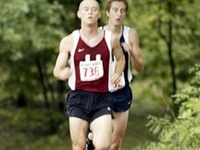 Harvard also has a “semi-secret weapon,” as junior captain Reed Bienvenu described freshman sensation Sean Barrett, who finished an impressive 31st in this Friday’s New England Cross Country Championships. While many of the varsity runners rested this weekend in preparation for next week’s pre-nationals, the rest of the team held its own as Harvard, led by Barrett (25:26), finished 14th out of a 47-team field. Providence finished in first place, placing two runners in the top three to take home the championship. Also placing in the top-100 finishers for the Crimson were junior Sameer Narang (26:00), and freshmen Jonathan Paul (26:16) and Kevin Lyons (26:16). They placed 69th, 97th and 98th, respectively. With this increasing success, especially among the freshmen, the team has seen obvious dividends from its intensive training over the last few months. “We’ve been doing some heavy mileage as well as long tempo runs and some fast interval work, primarily repeat 1000’s,” said Bienvenu, describing the variety and intensity of the Crimson’s daily workouts. The freshmen on the team reflect Bienvenu’s lead and motivation. Harvard has an overabundance of belief in itself and the Crimson runners have set their sights on victory at Heptagonals, where the Ivy League championship is decided. While Harvard fell by just one point to Yale last weekend, the team has turned this disappointing loss into a clear objective for Heptagonals. According to Bienvenu, junior Alasdair McLean-Foreman will take aim at winning the race, with his teammates falling in behind him. Though other runners state it more definitively, they all have the same idea.